Its been long since i posted a recipe here. I got busy with this and that, spent a couple of months trying to recover with as much patience as I could from several things besides a very severe case of bronchitis. The year ended, a new one came and I still couldnt post anything. I have been cooking though everyday food continues to be a serious maze of quick fixes. Amma spent 6 weeks with me and recently returned to bangalore. As always I try to make interesting meals when she is around. This is a biryani I tried for the first time, making up most of it as i went. But it was highly praised. My friend D cant believe i became a vegetarian and with her nose turned up in the air at me, asked if I have a halfway decent mushroom biryani recipe. This one is for her. Its the second half of february and now is as good a time as any to do something about the lack of pace around here. I’m hoping to get back to being more active on the blog. I have so many other things happening around me, that this tends to suffer. But I have missed it almost as much as it missed me I would like to think. Earlier I made most biryanis in the pressure cooker and tho i always had fluffy grains of rice, I have switched to stove top cooking in a large kadai or open heavy bottomed pan. I find that the grains retain their shape so much better and you can enjoy each separated long grain of rice this way. 1/2 cup each of fresh mint and coriander leaves. Mix all of the above together and set aside in the refrigerator for about 30 mins. In a thick bottomed kadai or deep pan, heat two tablespoons of oil and one tablespoon of ghee. Add two bay leaves, 2-3 cloves, two small sticks of cinnamon and a couple of star anise, one teaspoon of shahi jeera and 1 teaspoon of fennel seeds. When it splutters add the marinating mushrooms with the entire marinade and cook on med flame for five mins till the mushrooms begin to shrink and the oil is coming to the sides of the pan. Add one cup of coconut milk, cook for a few minutes. Drain the water that the rice is soaking in. reserve the same water to be used to cook the rice. Sauté the rice gently so that it doesn’t break till it is well coated in the masala, add the drained water from the soaking rice, check for salt and add more if needed, also add half teaspoon of garam masala powder. Note: its important to note that basmati rice may require varying proportions of water according to the age and quality of the rice. As a thumb rule, i use roughly double the quantity of water ( 1 cup rice , 2 cups water) if i cook in an open pan and one and a half times the amount of rice & water ratio if cooking in a pressure or rice cooker. please check the instructions on the package of basmati rice and follow that. Hi. I had made this biryani earlier and today I made it using chicken, instead of mushrooms. Both times the results were awesome. Thank you very much for this recipe. I had to modify the coming time and the spices a little for the chicken, but wonderful final product. Thanks again. I tried it for the first time though not an expert of cooking. It come out excellent. My wife and daughter enjoyed it. Thanks Arundati. I Made this during one of the get together’ …where everyone were suppose to get some food..and trust me, mine was the “hit”.. Everyone loved it..yum it was!… Your recipe made my day.. Compliments poured on me..
thank you for your kind words Kirthi, am glad it was a hit. This is one of the most popular recipes on my blog. Hi Arundati, what i love about her is she makes cooking/baking (my teacher) so simple for people like me. This is an awesome recipe..everyone at home loved it, including my 3yr old. Thank you. This comment just made my day! thank you for your generous praise and I am so glad your family especially your baby liked it! thank you for trying it out~! One thing i love about you…you make cooking look simple with your awesome recipes.. this one was just so tasty n yummmmmm… everyone in the family like it including my 3yr old..
thank you so much for your generous words. much love! I tried d recipe yest… Was very tasty… Restaurant style biryani @ home… Thanks a lot for d recipe… Can I make veg biryani (with carrot, beans n peas) d same way??? Am so glad that you like the recipe. It is one of the most popular on this blog and also a favourite with my family. 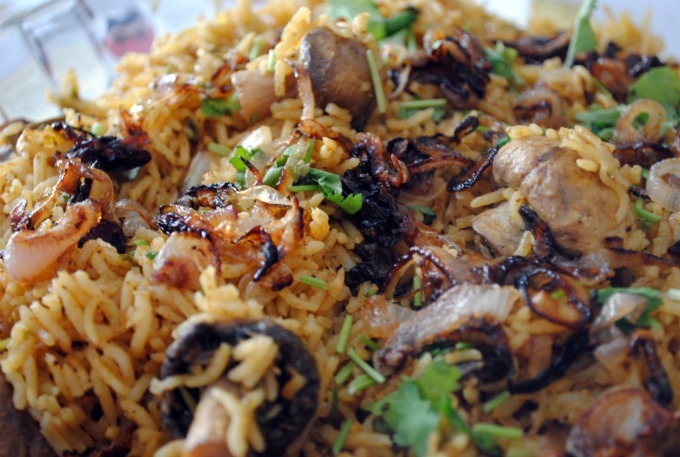 Very nice recipe of mushroom biryani, can I use any type of mushrooms. I tried this once for a potluck and everyone loved it. Since then I have made this very often and every time it turns out great. Love it! Thank you so much for your feedback. Makes me so happy when I hear from someone who has tried and liked a recipe. It is one of the most popular recipe on this blog! Presentation is very good. I use the same method for making all types of biryani as the flavor of spices gets well combined with rice leaving nice aroma to the dish. I liked your site. Its so tasty and delicious. 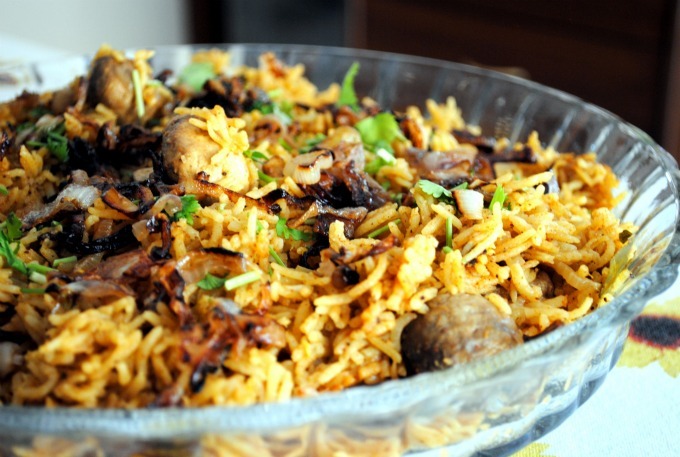 I made this biryani today…..it was just awesome!!!! thank you for writing, trying it out and i am so glad you liked it. this remains one of the most popular of my blogposts. thank you so much! and am glad you liked the recipe… will surely add more rice preparations… always makes me happy when someone tries out a recipe and likes it! hello! no problem at all. coconut milk gives the biryani a nice depth of flavour, but can be substituted with plain water or water flavoured with a stock cube in the same quantity. aaf’noon gonna to be ur recipe…………’;().. Awesome recipe! Its in my kitchen getting cooked now and the aroma is just way too good ! Thanks for the receipe. I have a small doubt. It has been mentioned as fry 3 cups onion and keep it aside. But in marinade it is mentioned as 1 cup of fried onion. If it is given by mistake pls correct. Hi Blacky, thanks for stopping by, the 2 cups of fried onions are used in the garnish while serving the biryani. it is mentioned in the recipe… do read…. let me know how it turned out… this is one of the most popular recipes on my blog! I wanted to say thank you for an awesome and flavourful recipe, made this tonight along with a simple cucumber raita and it was delish! The kitchen smells wonderful! Thanks for sharing this tasty recipe. Tried this strday and it was awesome. I rriade it and it came out awesome. Usually I make them in the cooker, trying open vessel for first time. What you say about the rice grains texture is true. Each rice turned out longer than it comes in the cooker. Amazing flavour and so easy to make. I had my family begging for more! This dish is definitely going to occupy the centre place whenever I am going to call people over. Thanks a lot for sharing such a marvelous recipe. awesome briyani… just now tried and the result was amazing yaar… my hubby loved it….. i wil try for chicken and mutton,even veggies u said and will come back with my comments.. thanks for sharing ur tasty briyani. I am cooking this briyani right now (we’re using a rice cooker) and it smells and tastes phenomenal! The only thing I added was cubed tomatoes at the end before covering it to cook. Fantastic recipe, we’ll definitely be making this again soon! I am a student and a beginner level cooking experimenter 😀 Had a bowl of mushrooms and was wondering what to do with them. Now I know! Hubby and I just crazy about this Biryani..we tried this one twice and came out great both times!…We are hard code carnivores..but with this Biryani, we dont need any meat !! Awesome Awesome..I am confident that I can cook this for guests now.. Fantastic recipe. I made this today. I also added a few saffron strands to the coconut milk to give the briyani that rich yellow colour. Additionally, I also fried cashewnuts with onion and sprinkled them on top. This is defi staying in my fav list! thank you very much. Delicious! Made it yesterday and enjoyed it on my own. Thank you for sharing. Hi Arundati – This dish was a mega hit at the dinner party I hosted over the weekend. In lieu of mushrooms, I used a packet of cauliflowers, carrots and broccoli. It was perfect! Thanks again. Mushrooms and rice- some of my favorite ingredients to work with! This recipe sounds delicious! I am definitely making this soon. Quick question: what would be the best alternative to mushrooms in this recipe? hi sundar, glad that you liked the recipe and want to try it. you could sub with eggs if you eat, use 4-5 hardboiled, or assorted veggies like potatoes, carrot, cauliflower etc. make sure they are half cooked before adding the rice, as the cooking time is only 15 minutes. else you could lightly steam them for 3-4 minutes before marination. let me know how you liked it. Good to see you back, arundati. Biryani looks very inviting. Mouthwatering pics. Missed you Aru. Glad that you posted this recipe and will try it with eggs today!! Very goodlooking biriyani this one is!